In today’s edition of Incompetent Criminals, a wannabe burglar crashed through the ceiling of a Waffle House in Tuscumbia, Alabama. 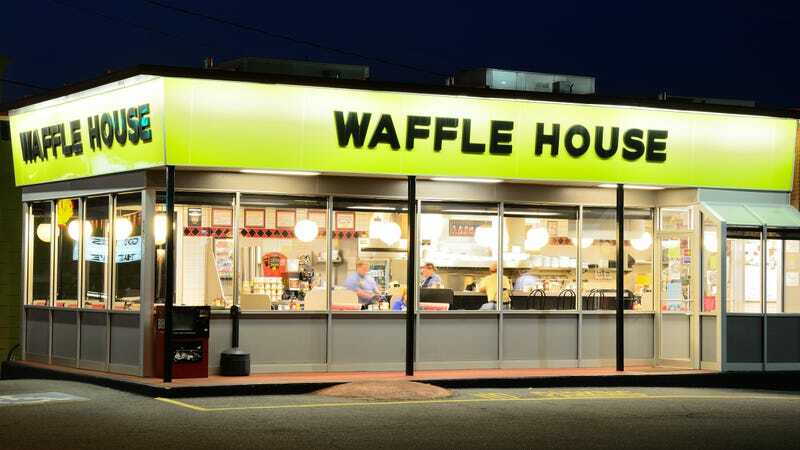 According to the Times Daily of Florence, Alabama, he was headed toward the office of the Waffle House restaurant after climbing through the ceiling of the bathroom, where he damaged the sink and toilet. He then apparently used his pants to tie the door shut, which accounts for his pantsless state when he crashed through the restaurant ceiling a bit early. What an unhappy surprise for those Waffle House diners. Police Chief Tony Logan reports that “Some of the people inside tried to grab him when he fell into the dining area, but he fought them off, ran out and got into a car and left.” The man then took off in his getaway car with a driver, and the two aspirational thieves led police on a car chase and subsequent foot race. Unfortunately for Pantsless Man, though, he left his driver’s license and other forms of ID in his pants in the bathroom. We only pull out this exclamation when it’s warranted, but this is certainly one of those times: D’oh! Chief Logan also tells the Times Daily that “it is believed Bost was on drugs when he fell into the dining area with nothing but his underwear on.” Ya don’t say.